Modern engines demand increased performance from motor oil. Turbochargers, direct fuel injection, variable valve timing and other advancements improve fuel economy and performance, but result in increased operating temperatures, pressures and contaminants, while increasing the likelihood of viscosity loss due to mechanical shear. Motor oil today must guard against deposits, viscosity increase and wear for today’s sensitive engine systems to function as designed. 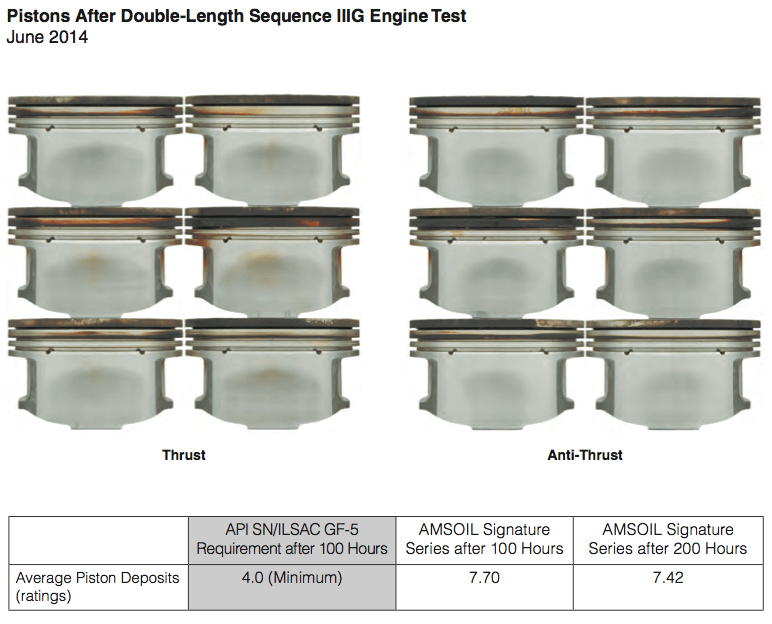 The Sequence IIIG Engine Test (ASTM D7320) is an industry-standard test designed to evaluate motor oil in several key performance areas. It must be passed to meet the API SN and ILSAC GF-5 motor oil specifications. Results in the 100-hour test are an important indicator of how well a motor oil will perform in real-world service. Determine the performance of AMSOIL Signature Series 5W-30 Synthetic Motor Oil in the Sequence IIIG Engine Test. Further determine the performance of the lubricant after doubling the standard test interval to 200 hours. AMSOIL Signature Series 5W-30 Synthetic Motor Oil was sent to an independent, third-party laboratory for testing. After a standard-length 100-hour Sequence IIIG Engine Test, measurements for piston deposits, viscosity increase and cam/lifter wear were recorded by a calibrated engine rater. The engine was reassembled and a second 100-hour test was conducted using the same oil and engine parts, placing 200 total hours on the engine and oil. Afterward, the engine was disassembled and rated again. The Sequence IIIG Engine Test is designed to evaluate automotive engine oils for high-temperature performance, including oil thickening, piston deposits, oil consumption and engine wear during moderately high-speed, high-temperature service. Testing is performed using a 3.8L General Motors V6 engine that operates at 126 hp and 3,600 rpm. Motor oil temperature during the test reaches a steady 302°F. As a comparison, the typical engine temperature of a passenger car/light truck is approximately 200°F. 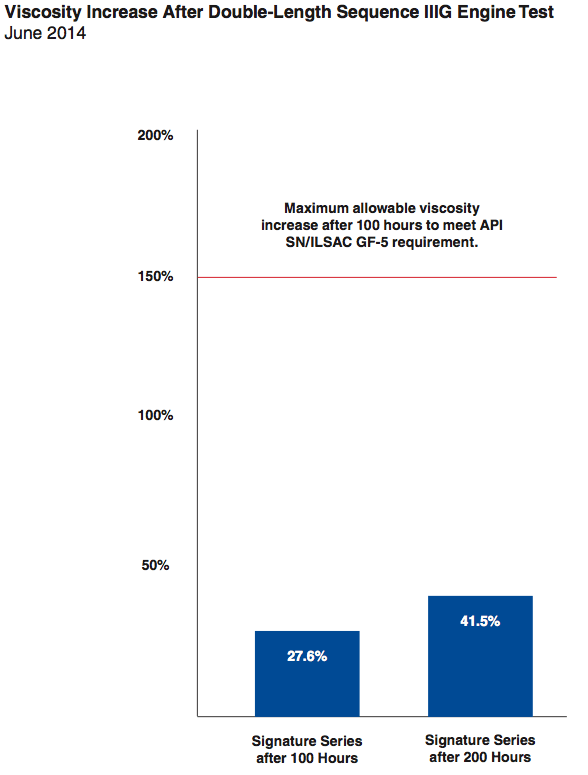 A rating of 5.5 for piston deposits after 100 hours of testing is commonly considered outstanding, while a minimum 4.0 rating must be earned to meet the API SN/ILSAC GF-5 motor oil specification. Even after 200 hours of testing, Signature Series limited deposits and earned ratings well above the minimum threshold. 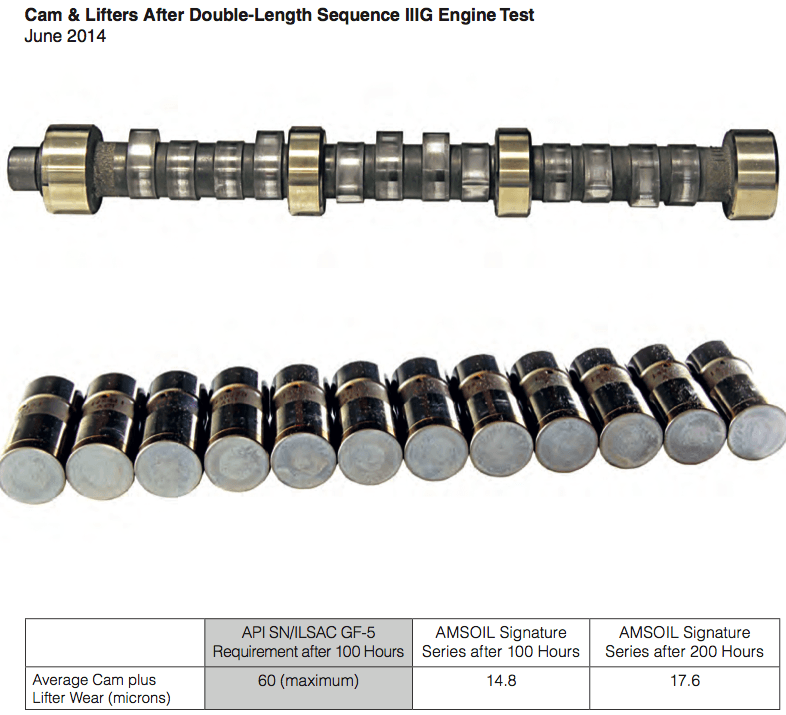 An example of a piston lubricated with a competitor’s oil that failed a normal-length Sequence IIIG Engine Test is included for comparison. Signature Series demonstrated excellent thermal stability and cleanliness properties, easily passing the double-length test. Carbon buildup on pistons can cause the piston rings to stick in their grooves. Stuck rings can fail to seal the combustion chamber, leading to oil consumption and low compression, negatively affecting engine performance. Excess piston deposits can also lead to pre-ignition and engine knocking, which results in lost power, reduced fuel economy and, in severe cases, engine damage. 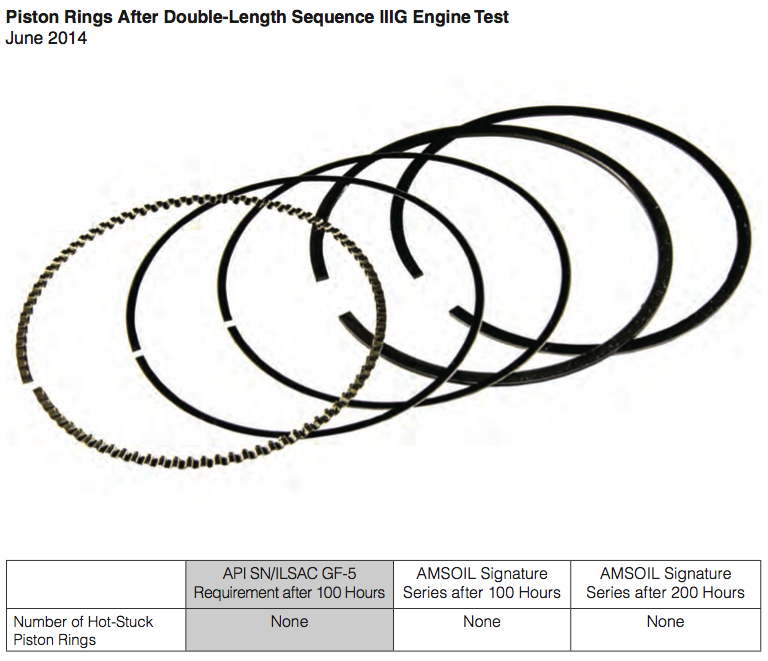 To pass the Sequence IIIG Engine Test, a motor oil must prevent hot-stuck piston rings. Signature Series completely prevented hot- stuck rings in the double-length test, demonstrating excellent protection against carbon buildup. The rings shown are representative of all piston rings in the test. The camshaft and lifter wear values provide a measure of the anti-wear quality of the oil under conditions of high-pressure mechanical contact. Even after 200 hours of testing, Signature Series Synthetic Motor Oil limited wear well below the maximum allowable, providing excellent wear protection. Motor oil can thicken (viscosity increase) over time in service, leading to sludge formation. Thicker oil is more difficult to circulate, reducing fuel economy, while sludge can clog oil filters, oil passageways and the oil pick-up tube screen, leading to pump starvation and catastrophic engine failure. A viscosity increase of 50-60 percent is considered very good after 100 hours of Sequence IIIG Engine Testing. Signature Series showed only a 27.6 percent viscosity increase after 100 hours. Even after doubling the test interval, viscosity increase (41.5 percent) remained well below the threshold. Signature Series demonstrated outstanding oxidative stability. Signature Series 5W-30 Synthetic Motor Oil met API SN/ILSAC GF-5 performance requirements despite the severe nature of the double-length Sequence IIIG Engine Test. Values for piston deposits, hot-stuck rings, cam-plus-lifter wear and viscosity increase remained well within the requirements after 100 hours of testing. Even after doubling the test interval to 200 hours, the oil easily met all requirements and delivered excellent performance. Results demonstrate that Signature Series provides outstanding engine protection and cleanliness in today’s hot-running, sophisticated engines.